Why you should quit Blogging and Join PostAnyArticle? You have heard a lot of things about blogging, like you can earn money from it and you are boss of your own etc.While blogging is also a difficult and time taking job which demands extreme devotion and determination from your side. REASONS So here are some of the main reasons why it is better to join PostAnyArticle instead of making your own blog and building it from the scratch. 1) Blogging is a quite difficult job to do as compare to posting 100 words articles on PAA. 2) You will not be successful in blogging just overnight.Blogging takes time. 3) Blogging is kind of regular job, unlike posting articles on PAA and forgetting about rest of the things. 4) In blogging , you will have to take care of everything for Example CPM,CPA, placement of ads etc.While there is no such need for that if you join PAA. 5) You have to be good in SEO, if you want to be successful in blogging.While on PAA , you don’t really have to because page rank of PAA is already good to some extent and it is increasing day by day. So why wait? , Join now . I am damn sure that you will never regret joining .Sign up Link of PostAnyArticle is given below. PostAnyArticle Site Review , Earn by writing Short Posts. PostAnyArticle is a revenue sharing site just like Bubblews,Teckler,FullofKnowledge and ExpertPages.They ask you to post articles and in turn you get money according to the views your articles receive.They give your 75% of the revenue generated by the views on your articles. What is the Best thing About PostAnyArticle? Best thing about PostAnyArticle is that you can re-post your old articles there.For Example if you write on Squidoo, Hubpages or you have a blog which is long dead from ages , you can transfer your articles from them to PostAnyArticle and earn money from them. You just need to post your old articles there and forget about them , you will get your money after 28 days.It is one of the best sources of Passive Income. How does PostAnyArticle Pay per View? Actually PostAnyArticle pays you according to the CPM of the site.In August 2013, their CPM was 40$ which means you get 40$ for receiving 1000 views . Hence it is not fixed how much you earn from 1000 views , it depends upon the CPM of site.They pay you via Paypal. Is PostAnyArticle a legit site? Yes, it 100% pays.This site is hardly 2 months old , but they are legit. I posted few articles on PostAnyArticle and never came back but after somedays I recieved 74 cents in my paypal account from 55 views I recieved on my articles!!!. While I had totally forgotten PostAnyArticle.Now I am there again , posting as many articles as I can. There is no minimum payout limit , they pay you after 28 days no matter whether you earned 75 cents or 75 dollars. Here is a related and helpful post about PostAnyArticle. 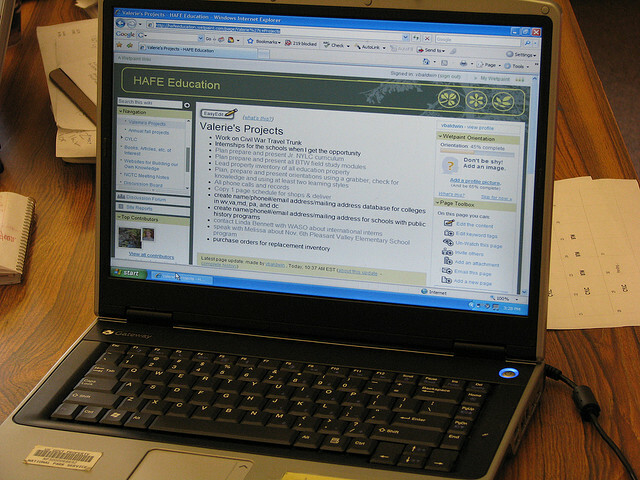 Laptop or Desktop?Which one is better? So what do you prefer Laptop or Computer? Let me explain some pros and cons of both. They have small size and occupy less space. They have great portability, you can take them anywhere. They are battery based, you can use them without power supply. You can use it while traveling. You can take it to your office or college. If you abuse your laptop,it can cause serious health problems. It has some overheating problems. It spoils your habbits xD. It is very comfortable to use. You can easily use it for long hours. It does not have any such overheating problem. It does not have serious health hazards. It requires power supply to run. It has less portability, you can not take it everywhere. You have to sit at a particular place to use it. I just want to tell you that I am busy in other parts of Internet, I will continue my blog. So on Thursday, there was a heck of drama going on in Pakistan’s Capital(Islamabad).An armed man along his wife and two children drove to the Red Zone Area of Islamabad and exposed the loop holes in security.What ever he did or why ever he did,it is true that he just made Capital Police a laughing stock in front of the whole World.There were many claims from security agencies about the strong and secured situation of Islamabad but all of them just proved wrong on Thursday late afternoon. 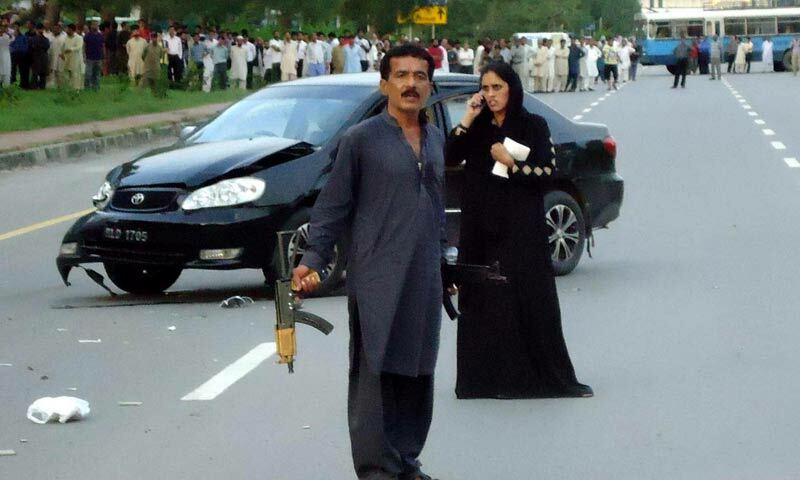 Armed man name is Sikander and his wife’s name is Kanwal.He had two rifles in his hand and a black Honda Corolla.He was just wandering near his car and his wife was taking his message to the officers and media persons.He also shot some fire at policemen. He said that he wants elimination of corruption and vulgarity from the country.He also mentioned that he wants totally shariat System in Pakistan while on the other hand he was smoking.He came there well prepared but due to his behaviour infront of media persons,security agencies and his statements,he was labelled as Mad Person. According to media anchors,he paralyzed the whole capital city,some also said the whole Country just for the sake of the ratings.But in real that man Sikander really gave an entertainment to the citizens.People left their homes and came to the Red Zone where the whole Drama was taking place. MQM’s leader Nabeel Gabol also talked to him,but it was not worth of any result. The whole drama continued for about 5 to 6 hours.PPPP leader Zamurd Khan played a vital role in catching him.He went to him for the sake of talking and then suddenly he jumped on him to take away his weopan.Sikander was caught alive as ordered by the Interior Minister Chaudhry NIsar and was then taken to the PIMS Hospital for the treatement of his wounds. According to the information given by the electronic media,he has two wives.One is in Dubai and the other one was with him during the incident.He is an inhabitant of Hafizabad and it is also stated that He was deported from Dubai in 1990. The car he had was rented and before that incident he was living in a hotel at Abpara market for 4 to 5 days. All kinds of devices need a unique ip address to communicate with other devices on the network.So to connect in a network or to be a part of network for the sake of communication with other devices,the device must have a unique IP address(Internet Protocol Address).By device here I mean anything,like routers,computers,printers etc. So basically there are two ways to assign the IP address configuration to the computer. This has nothing to do with DHCP.This approach asks you to manually assign the ip address configuration to the computer,willing to be the part of the network.It is ok unless there are computers in a single number digit.But if there are hundreds of computers and other mobile devices then this approach would be really painful for you or Network Administrator and since it is all manuall work so the chances of wrong input are quite high.Network Administrator will have to assign following details to each and every computer that joins the network. 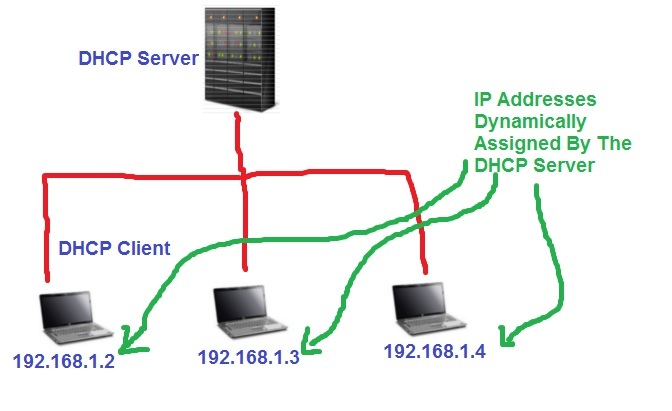 In this approach the process of assigning IP addresses is automated.You just provide with the range of IP addresses from which the ip addresses are assigned to the computers in the network.This is where the DHCP role comes in. 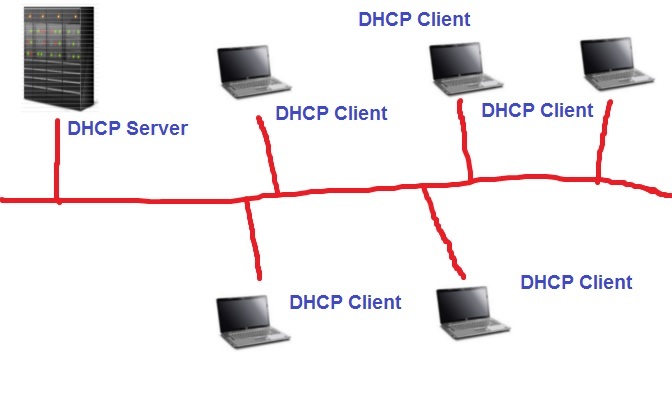 DHCP stands for “Dynamic Host Configuration Protocol“.Actually it is a service or you may call it a server installed on your router device or any other central device of the network.It dynamically assigns the IP addresses to computers(DHCP Clients). This is the initial phase,when the new computer joins the network it broadcasts a message in the network.In which it asks whether any DHCP Server is available or not to assign me an IP address?.Now If there is any DHCP Server it will answer to the message.If there are multiple DHCP Servers then all of them will reply to it but the one that is nearest will further deal with it.In the message it includes the information about sending Port(DHCP Client Port) and destination port(DHCP Server Port). There are pre-defined ports for DHCP Servers and DHCP Clients. DHCP Clients Use UDP Port 68 to send and receive messages. DHCP Servers Use UDP Port 67 to send and receive messages. In this phase DHCP Server offers an IP address to the DHCP Client that sent the message via broadcast.In this case the sending port will be 67 and destination port will be 68 unlike the Discovery Phase where the sending port was 68 and destination port was 67. Because In Discovery Phase DHCP Client was sending message to DHCP Server. Now In Offer Phase DHCP Server is sending message to DHCP Client. 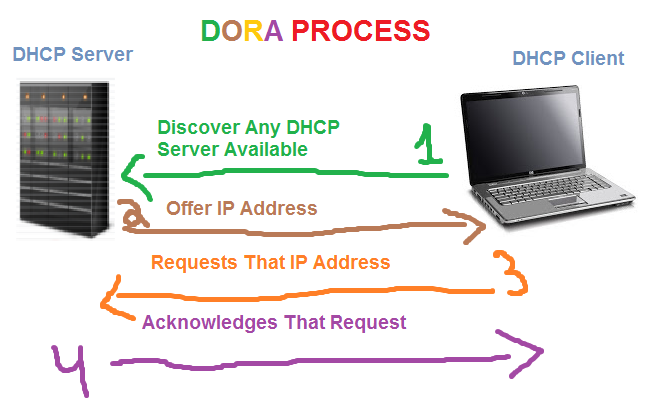 This is the phase in which the DHCP Client will read the offer of DHCP Server and will request for that IP address. 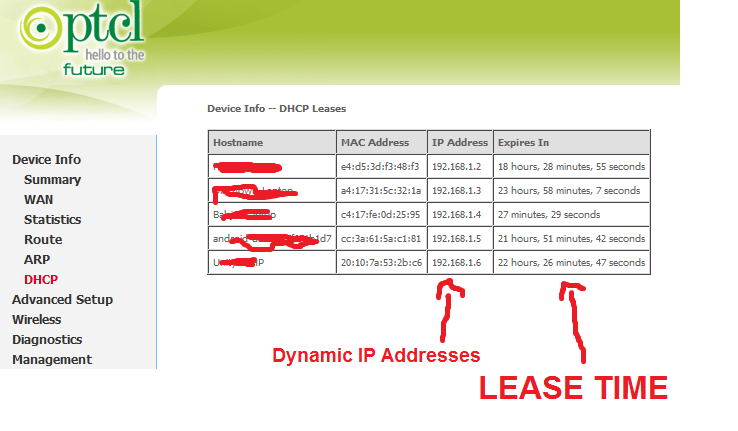 In the last phase DHCP Server sends back the message to the new computer telling that its request for the IP address is received and now I am assigning that IP address to you with the Lease time this and this etc. How DHCP Client and DHCP Servers know that this message is of their concern? By checking the mac address and UDP Port Number.If Destination Port is 68 then ofcourse this message is not for DHCP Server and if its Destination Port is 67 then it is obvious that this message has nothing to do with DHCP Clients. In DHCP Scope we defines the range of IP addresses from which DHCP will assign IP adresses to DHCP Clients on the network. So DHCP will assign IP address from above 100 specified IP addresses. As you can guess from the word,DHCP Reservation is used to reserve the IP Addresses so that they will not be alloted to the other DHCP Clients or devices that join the network.Reservation can also be done by the Mac Address of a computer.If the Mac Address of the computer does not match the reserved IP address,this IP address will not be assigned to it.Hence it will be assigned only to the concerned device or DHCP Client. We have defined the scope of DHCP as 192.168.1.1 – 192.168.1.100 , Now there is a web server working on our network whose IP address is 192.168.1.50 and it remains the same all the time.So we would reserve that IP address. We do reservations for the service that needs unique and static IP address.In other words we perform reservation of IP addresses to avoid the conflict between devices for having same IP addresses. 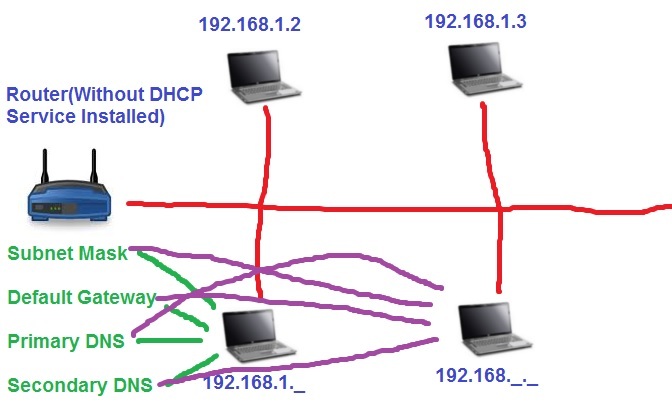 So as we have learned that DHCP assigns IP addresses dynamically to the devices on the network,from the list of IP addresses that we have given to it(Scope).Imagine a situation in which we have 10 IP addresses in our scope and there is a DHCP Client or any other device that is keep connecting and disconnecting from the network,what will happen is that this device or computer will utilize all of that 10 IP addresses defined by us and leave our DHCP Server bare handed. So To avoid this situation we have a functionality of lease time.When the DHCP Server assigns an IP address to any DHCP Client,it also gives us the information about lease time.It is a time for the ip address to be expired.So when the lease time is over the IP address goes back to the DHCP Server and DHCP Server assigns that IP address to other computer.Whenever a computer or device leaves the network,its IP addresses goes back to DHCP Server which is then assigned to any other computer. There is a computer whose lease time is 10 minutes.After half of the lease time passed,that DHCP Client will sends request to DHCP Server for renewing its IP address.If DHCP Server accepts the request then its lease time is increased otherwise it will disconnect when the lease time is passed and then it will request DHCP server again and follow the whole the DORA Process Again. Till now we were talking about the DHCP Clients that are on the same subnet.Well what if the network is very wide and there are different DHCP Clients on different subnets and they reside on the other side of DHCP Server? Well here DHCP Relay Agent gets involved.Whenever a new DHCP Client joins the network it has to discover the DHCP Server by broadcasting a message right?So it broadcasts a message asking whether there is any DHCP Server or not?Since the DHCP Server is residing on the other side,new computer(DHCP Client) can not directly communicate with it.So DHCP Relay Agent takes the message broadcasted by it and then unicasts that message to DHCP Servers.In return the nearest and DHCP Server replies back also with in a unicast way to DHCP Relay Agent.Then this relay agent broadcasts this message to the DHCP Client.In this way the job gets done using DHCP Relay Agent. Throw down the question if you have any…. Guys this tutorial will give you basic to intermediate concept about PHP.If you are already advanced in PHP,you can read it as a reminder.One thing more is that it is possible that you find that tutorial very long,so I will suggest you to take your time and read it thoroughly. PHP stands for “PHP Hypertext Preprocessor”.It is used to develop web-based applications.About 45% of the sites are PHP based and their number is increasing very rapidly.It is interpreter based,all of its scripts are executed by the interpreter installed on the server.Now you have first question in your mind.PHP Pattern or PHP Paradigm is imperative and object oriented.It is a server side scripting language.What does it mean by Server Side Scripting Language?Actually there are two kinds of scripting languages. While in Server Side Scripting Language,all of the scripts are run on the server where the site is hosted and then after executing those scripts information is sent back to the user browser(mozilla,google chrome) in html coding.Examples are PHP,Java,ASP.NET,Perl. but when you check its source,you see no php coding at all.You see all the coding in HTML or CSS. Because PHP is a server side scripting language,when we open that link in our browser.Server reads our request and run all the php script written in it on its own side and then sends back the information in HTML form because our browser can understand only HTML.I think now you have gotten the idea of server side scripting language. Server(Any hosting place) with PHP interpreter=>Where our php code will run. As I have said earlier that PHP is interpreter based language unlike other languages like C,C++ and Visual Basic that are compiler based.So to make a PHP Based Website,first step is to install php on the web server.There are different versions of PHP like PHP 5.5.1 & PHP 5.4.17 .One of major advantage of PHP is that we can embed PHP codes in HTML file. PHP syntax is pretty similar to the syntax of C++ which is also an object oriented programming language.PHP code starts from <?php and ends on ?>.Like in C++,PHP statements also ends on semicolon and same forward slashes are used for inline comments.It is Case-Sensitive too. As we know that PHP can be embedded in the HTML file,so question arises that how interpreter will know that whether this is HTML coding or PHP coding?This is where the role of php tags <?php and ?> comes. ?> // It Tells the interpreter that PHP code is finished at that point. In PHP you don’t need to declare the data type of variable! unlike C++ or other language where you have to first declare the variable and then assign value to it. In PHP variables names start from dollar sign.Example $test,$Test,$phone,$x,$house1,$name_school,$your-problem.Focus carefully on that example,I did not give you that example randomly.It has some meaning in it.Think about it till then I tell you how to assign values to variables. Assigning values to any variable. As I told you before that PHP feels no need for variable declaration.Question arises that how PHP interpreter will know that which data type is it of?Is it a string, or s it an integer?The answer is that interpreter determines the data type from the way of value assigned to the variables.Like if it is a string then you will write value in double quotation marks ( $saying=”God is Forgiving”; ).If the value is integer then there is no need for quotation marks ( $number=23; ).We put that semicolon in the end to tell the interpreter that this statement is finished. Did you focus on that about example as I said? We can use variables like $test,$Test,$phone,$x,$house1,$name_school,$your-problem. What was the meaning behind? Okay now here I tell you.Actually above example tells you various things about variables used in PHP. First– PHP is case sensitive language.Which means that $test and $Test are two different variables. Second-Variable name can be a single alphabet like $x. Third-Variable name can contain underscore and hyphen sign but no spaces.Like that $name_school and $your-problem. Fourth-Variable name can contain a number in it.E,g $house1.But Variable name can not start with number. Which one is better to be used,underscore or hyphen? Actually underscore is better approach to be used.Because it can be easily distinguished while on the other hand hyphen is very ambiguous.It looks like a minus sign.It makes things complicated and hard to understand. Remember it depends upon the situation what to use and what to not. So it is not necessary and always good to use underscores every where.Sometimes we have to avoid underscores too. Dont take that above thing very seriously if you are beginner because i learned that thing from my experience and you will learn it too when you will work in PHP so just forget about it if you can’t understand it now. Okay now let me give you an example of code that prints “Hello World” on the screen. You make variable $x and assign that string value “Hello World” to it and then print the variable $x. Okay now open any text editor and type that code in it. Save it as filename.php after selecting “all files” option. You have made your first PHP Program. To watch the output of program,we will upload it on the server where PHP interpreter is installed and then we will open that file via web browser. This question is 200% person obvious.Where you will practice PHP?I know 90% of you don’t have any website,any hosting place where you can run php codes for practice.Well I can guess what are you thinking,You are thinking that will we have to purchase a domain and hosting place for it first to learn php?Not at all! You will not buy any domain or hosting to learn PHP. You will do everything on your own computer. The thing you need to have is a place for hosting,right?Other two things you already have,like web browser in which you are reading that tutorial and a text editor(notepad) which can be found at start–>Accessories–>Notepad. There are two methods for getting free hosting . 000webhost is a place where you can have free domain and webhosting. Make Your Account that is 100%. Register Any domain name and start practicing on it. In this method our computer will act as a local host and we can independently practice PHP,even without having access to internet. WAMP and LAMP allow our computer to do that.Now what are WAMP and LAMP?WAMP stands for WIndows Apache MYSQL PHP,actually it is a web development environment.It allows us to create web applications offline on our computer.LAMP is just a same thing,the only difference is that WAMP is for Windows users while LAMP is for linux users.If you find confusing that WAMP and LAMP thing then you can forget about it.Just remember XAMPP,it supports all of the user around the World.Everybody can use it freely. Just go to the site http://www.apachefriends.org/en/xampp.html as I am windows user I will download XAMPP for windows. Go to the directory where it is installed. There will be a folder named as “www” without quotation marks,Copy your php files to this server. Now Turn on the WAMP and open your browser. It will open your php file!. In the end I would say that knowledge is power but sharing knowledge is powerful so feel free to share my tutorial on your blogs,sites and forums.